Kids' Book Review: Review: The Royal Babysitters - Babies Stink!!! Review: The Royal Babysitters - Babies Stink!!! Sextuplet baby princes and their stroppy older brother, together with his giant boa constrictor, are enough of a challenge, but things spiral out of control when the neighbouring King decides to invade. With an army of robotic mermaids, a zeppelin that shoots killer hummingbirds, wasps, hornets and butterflies, Holly and Anna have their work cut out for them. 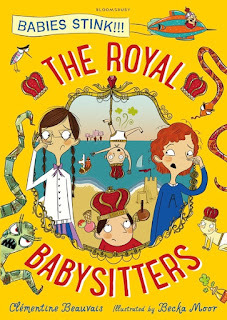 With fast-paced action, plenty of silliness and cartoon illustrations that complement the text to perfection, The Royal Babysitters is definitely middle reading fun. However, there are more than enough challenging words to stretch the confident reader, so shared reading might be the way to go for the more tentative reader. Whatever you do, include this on your list of humorous stories. It’s sure to trigger a snort or two of laughter.